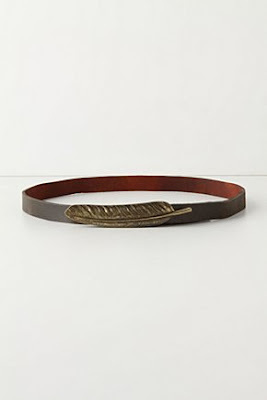 I loved the look of Anthropologie's feather-clasped belt (pictured above), but I didn't want to spend $58 on a belt. So when I saw a $24 Ecote Skinny Metal feather belt on Urban Outfitter's site, I thought I'd give it a try. I have a lot of brown belts, so I opted for the black leather and silver feather version. The belt part is actually leather, which is nice. Not super supple leather, but I prefer skinny belts to be a little stiffer than wider belts. The black was actually black. Unfortunately, the metal feather looked fairly cheap. The silver tone was too bright. It didn't have the nice antiquing that the Anthro version had. The metal of the feather was a turn-off, but I would have been tempted to make it work had the belt fit. I ordered the the belt in a size small (the smallest size), but it was about 4 inches too large for me on the smallest hole. I have a belt punch, but because this is a skinny belt, I worried about making a mistake and ruining the integrity of the belt itself (perhaps leading to a tear at a newly made hole). I returned this belt. Overall, if you missed the Anthro version, this version could be a cute cheap replacement, but smaller-waisted ladies might be sized out. The other birdie belt I tried was the Ecote Stretch Sparrow Belt from Urban Outfitters (also $24). Because the belt fits snugly with the elastic, I wouldn't worry about the belt snapping open. Like with the feather belt, the metal on the sparrow belt looked fairly cheap in person. I was less bothered with the gold-toned sparrows than I was with the silver feather though. I thought the belt was fairly cute. Side note: I can't help self-mocking and thinking of the Portlandia "Put a bird on it" skit while wearing it. How appropriate that I tried on birdie belts with my bird and deer dress (aka Anthropologie Southward Stop Shirtdress)! I wore this out to Costco on Saturday where I ran into some faculty from my department. Y'all know I try to dress down when I go to school, so I felt oddly over dressed (not for Costco mind you, but for seeing faculty, lol. I'm a weird cookie). I've also been trying something new with my hair. Jean of Extra Petite posted how she gets some loose waves in her hair. I figured since I also have Asian hair, I might give it a try. I only had a 1" barrel curling iron (she recommends 2"), so my curls are tighter than hers. I can't decide how I like it on me. It really reminds me of when I was little. I was always trying to curl my hair. I'm not exactly sure why I had a fascination with it. I know my mom always wanted me to do it for special occasions, so I think I thought it was a way to get super dolled up - a way for me to be "pretty." I used warm curlers or curling irons. I even had that special wash and curl shampoo that made my hair more likely to hold a curl. There was a time in middle school where I rolled my wet hair up in rags every night so I could have "curls" in the morning. It never looked great. This looks better, but we'll see if I like it over time. The UO belt is a deadringer, but eeeks...huge I see. I'm surprised as isn't UO marketed to a younger group (like teens?) who are generally smaller waisted? I noticed a difference in your appearance immediately! Your hair looks fantastic with a slight wave/curl. And did you take our advice and put some colour on your lips? You are looking very pretty! Your belts and outfit is beautiful but may I just comment on your hair!!! I love it curled and waved like that!! Haha. Love the hair! Love the lipstick! 10! Bummer that both belts didn't work out for you. I was really into both belts, too bad the feather belt is too big. Thanks for the reviews, now I have some sort of vantage point if I do order. Great outfit, BTW! Your orange sweater perfectly matches your lipstick! How different of you to put this outfit together. I feel like I am seeing a totally different you. I sometimes go to costco overdressed, and thank goodness I did not ran into my boss or co-worker, becuase I too tend to underdress at work. If only! I really should have tried to find the SS dress in stores. I waited too long. You're waist is really tiny Lori. It's no wonder the belt was too big. To bad the metal quality was poor. And I love the gentle curls in your hair. I think you should wear it more often like that. I dress up every day of the week. Even for trips to Costco. I dont know about you, but it gives me confidence. Ha-ha! When are you expecting Budz to come home? It must be soon! Thank you for the belt reviews. There aren't too many bloggers who do accessory reviews and I'm glad that you did. I love your look for today. The tights go well with the dress and I like the addition of the coral cardigan to make this look a bit more spring-y (that's a word, right?). Yay- thanks for the belt review- I can't order from UO in my stupid province so I kept regretting not being able to try it as a substitute...now I don't have to cry! You softly curling locks are gorgeous, and I love your colour palette today!